Striking pilots' union members hold a press conference Friday. A strike by pilots at one of Taiwan’s biggest airlines has seen flights cancelled at several major airports. The strike was announced early Friday by the China Airlines branch of the Pilots Union Taoyuan. It comes part way through the Lunar New Year holiday, one of Taiwan’s busiest travel seasons. Pilots at the Taiwan-based China Airlines are unhappy about fatigue due to long hours on the job. 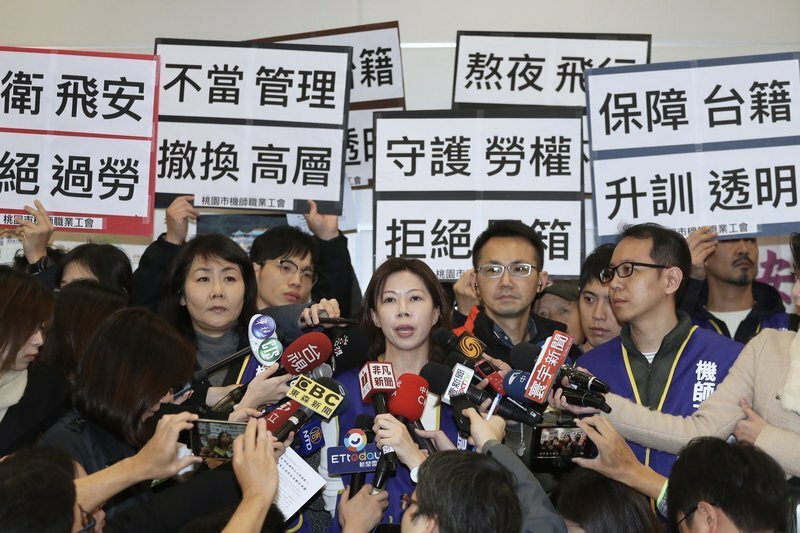 They are also calling for transparency in the promotion system and for the hiring of more Taiwanese rather than foreign pilots. Meanwhile, the pilots are demanding that the airline refrain from threatening or retaliating against union members. They want the airline to remove managers they say are unqualified. And they also want a month’s salary as a year-end bonus in line with practices at Taiwan’s other main airline, EVA Air. The union says that government agencies have tried to resolve issues between the airline and pilots. But according to the union, the airline has said that suggested improvements for working conditions would raise costs and damage its competitiveness. China Airlines announced at a press conference early Friday that 20 flights scheduled for Friday and Saturday have been cancelled. Fourteen are flights that were scheduled to depart from or arrive at Taoyuan International Airport, Taiwan’s main international gateway. Also affected are the airports serving the southern cities of Kaohsiung and Tainan.